Pink clusters of pea-like flowers adorn bristly locust shrubs at this time of year. This shrub is also called rose acacia because of the color of the blossoms. Note the bristly twigs. While walking the trails in town, you might occasionally be surprised by blossoms that seem to belong in a garden instead of the woods. If you discover rose-pink blossoms dangling in clusters from shrubby growth along a sunny path, you’ve probably found bristly locust (Robinia hispida). Its leaves have 7-15 leaflets. These shrubs probably mark a spot where a garden once grew. Or perhaps they “escaped” from a garden and now grow wild. This 6- or 8-foot shrub is native to the southeastern U.S., but it has been cultivated as an ornamental plant elsewhere, including New England. The Bowman Conservation Area is one area where bristly locust grows. Look along the short side trail leading to the amphitheater. This trail branches off the main trail, uphill from the picnic shelter but not far from the parking lot. The showy blossoms are not the only part of this shrub that is striking. Its twigs are densely covered with long, reddish-purple hairs – the reason for “bristly” in its name. The bristly twigs are most noticeable in the fall when the leaves are down. If seed pods form – which doesn’t always happen – they’re hairy, too. Bristly locust has been planted as hedge, not only to decorate gardens but also along roads and in disturbed areas to control erosion or to serve as a snow fence. It can do well in dry, relatively poor soil. Is bristly locust invasive? Apparently not in Massachusetts, although other states such as New Jersey and Pennsylvania consider it invasive. Its habit of spreading underground and sending up suckers makes it useful in stabilizing slopes, but the same habit can also make it hard to control. Perhaps our acidic soil helps to keep it in check in eastern Massachusetts. Bristly locust does have a relative that’s named as an invasive in Massachusetts – black locust (Robinia pseudoacacia). These 100-foot trees have drooping clusters of white pea-like blossoms with a heavy scent. You can notice black locusts in bloom along Otis Street (and other locations) at this time of year. These trees are also native to the southeastern U.S. and spread rapidly by root suckers. Their wood resists decay so they were once widely planted for wood for fence posts. Both bristly locust and black locust are toxic to humans and livestock, but the Cherokee Indians of the southeastern U.S. used them in similar ways as medicine. They chewed root bark to bring on vomiting. For toothaches, they pounded a root and held it on the painful tooth. They also used the wood of bristly locust for bows, blowgun darts, and pegs for houses. The pea-like blossoms of both locusts are a clue to something else about them. They are legumes – members of the pea or bean family (Fabaceae). This plant family has great economic value to humans. What’s the value of bristly locust? We can’t eat it, as we can do with protein-rich peas, lentils, beans, and peanuts. Nor can we feed it to livestock, as we can do with legumes such as alfalfa and clover. Yet like many of these other legumes, bristly locust enriches the soil by increasing the amount of nitrogen in it. So what’s the big deal about nitrogen? It’s a key ingredient in fertilizers, and plants and animals need nitrogen for DNA and proteins. Fully 78% of the atmosphere is nitrogen, but plants and animals can’t use this nitrogen. They need it to be combined with other substances, such as oxygen or hydrogen, before they can use it. Certain microbes can make these combinations. Where do legumes come in? Many of them, including bristly locust (and black locust), develop a favorable mutual relationship with the right kind of bacteria (Rhizobium). It’s done by a kind of favor trading. Bristly locust is a food plant for caterpillars of the silver-spotted skipper. 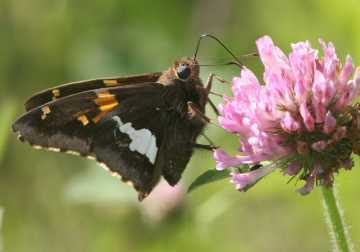 This brown butterfly is easy to recognize by the silvery white patch on its wings. It lays eggs on bristly locust and other legumes. Here it sips nectar from clover, also a legume. The legumes house the bacteria inside special nodules on their roots and send food to them. The bacteria, in turn, combine nitrogen from the air with other substances, making it possible for the legumes to use it in their own growth. When the legumes shed leaves or die, the nitrogen in decaying plant parts goes into the soil, enriching it for other plants. Much of the favor trading takes place through chemical communication. The legumes release chemicals into the soil that attract the right bacteria. These bacteria sense the chemicals and release chemicals of their own, prompting the legumes to do certain things. For example, the legumes curl their thin root hairs around the bacteria and grow protective root nodules for the bacteria to live in. The legumes also lower the oxygen level inside the nodules to suit the bacteria. 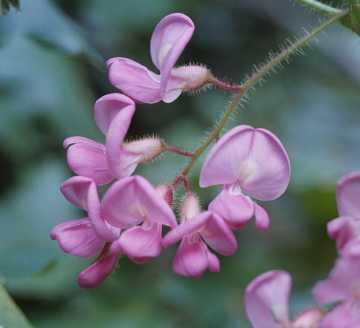 (For this the legumes use a chemical similar to the one that carries oxygen in our own blood!) Too much oxygen would damage the special chemical that the bacteria use in combining nitrogen with other substances. Thanks to all these arrangements, bristly locust can thrive in poor soils. Farmers can grow other legumes, such as clover (Trifolium), to plow under and improve the soil, or rotate legume crops such as soybeans with grain crops such as corn. Native Americans could grow beans and corn together and avoid wearing out the soil. The economic value and chemical complexities of legumes might help you appreciate bristly locust when you find it in the woods. But you can simply enjoy watching the insects that come to this prickly escaped shrub. Notice the bumblebees visiting the flowers. You may not see it, but their undersides get covered with pollen when they land. Bristly locust attracts butterflies throughout the summer. It’s a food plant for caterpillars of the silver-spotted skipper (Epargyreus clarus). This butterfly lays eggs on or near it, as well as on other legumes. Look for “silverspot” females fluttering around the plant and perhaps touching down briefly to sample the leaves with their feet, which have chemical sensors on them.